Let’s face it – the run up to mealtimes with your toddler can feel more like a preparation for battle than a nice, family bonding experience. All toddlers go through phases of throwing dramatic tantrums because they suddenly don’t want to try anything you are serving up. If you’re starting to lose your sanity and dread mealtimes with your little one, there’s one thing that can really help and that’s making their meals more fun. That’s it? That’s really the key to ending those unbearable mealtime battles? Well, no. Unfortunately, nothing will make mealtimes with your toddler happy and carefree 100% of the time. However, making their meals more fun can help in certain situations and reduce the battles you face. So, why does it help and how exactly can you make mealtimes a fun experience? Toddlers are renowned for their fussiness at the dining table. They know what they like and that’s exactly what they want. They don’t want to try new things, they’re perfectly happy with the handful of crackers they know and love. So, when it comes to giving them anything different, it’s a struggle to convince them they’ll enjoy it. Making the meals more fun however, can persuade even the fussiest eater to try new things. It won’t always work, but it can definitely help a lot on most days. Think of it like exercise for adults. If you don’t enjoy it, you’re not going to continue with it. The same applies here. Making the meals fun will help your little one look forward to eating and they’ll also be more likely to actually eat what is placed in front of them. So, the question is how can you make them more fun? 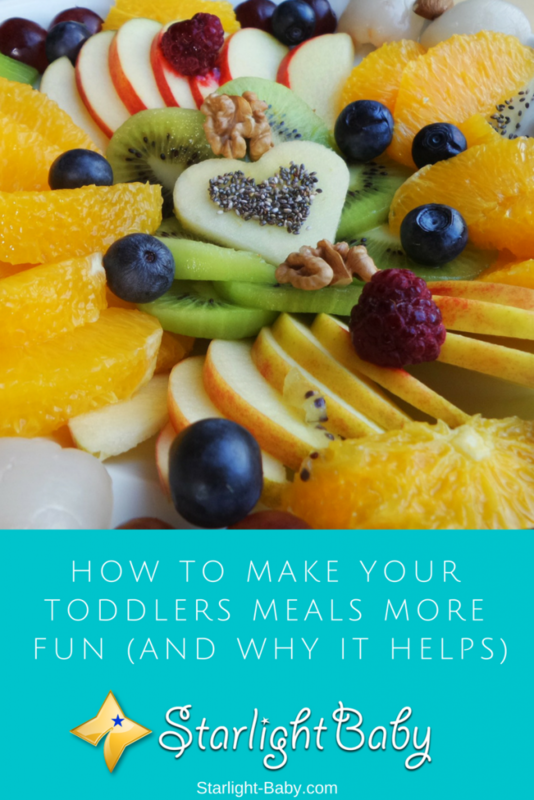 There’s actually a lot of different things you can do to make mealtimes more fun for your toddler. Below we’ll look at some of the best, most effective tips you can try out. One of the simplest tips which many parents swear by is making their toddler’s meals look fun. See the plate as your canvas and the food as your tools. Arrange the food in funny shapes, or if you’re quite artistic, try to create little food masterpieces. Your toddler will love it and for some reason will be more compelled to eat it. Try it, it actually works! If you need a little inspiration you can always search online. You’ll find lots of pictures of fun toddler meals that other parents have created on sites such as Pinterest. Toddlers are commonly drawn to finger foods and prefer things they can actually grab and put into the mouth. If you’ve noticed your little one goes into meltdown whenever they are faced with a bowl of sloppy food and a spoon, finger foods could be the answer. You can even create your own healthy finger foods if you’re worried about nutrition. Foods such as meat cubes, chunks of fruit and vegetable sticks are also great at teaching your toddler better coordination. One great way to raise the fun factor at mealtimes is to create your own story. You can use the foods as little characters if you’re feeling particularly creative. However, a simpler idea is to talk about the food, including its texture, color and where it usually grows or lives. Toddlers love a good story and if you do it every day, they’ll soon start to look forward to mealtimes to see which story they’re getting this time. To step it up a little, you and your toddler could create your own food songs. Singing and eating will definitely make mealtimes a fun experience! It’s easy to get stressed out as you witness your toddler eating. They may love feeding themselves, but that doesn’t mean they’re very good at it. They are still developing their table manners and hand to mouth coordination. So, it’s going to get messy – very messy! It may not be fun to clean up, but making a big deal over the mess is sure to lead to tantrums. It’s also going to make your toddler associate mealtimes with arguments and stress. Mess is a common part of toddler mealtimes and as long as they aren’t throwing food across the room on purpose, it’s often best to let it slide. As well as making your toddler’s food look fun, you can also give them more creative names. Broccoli for example, doesn’t sound very exciting, but call it something like a midget tree or a fun forest and your toddlers interest will soon perk up. Creating your own fun food names, or searching online for inspiration, will encourage your little one to try new things. It’s amazing how much difference a simple name can make! It’s not just the eating part of a meal that you can make more enjoyable for your toddler. It also helps a lot if you let them prepare the meal with you. Unlike adults, toddlers often love getting involved in chores. They like to feel grown up and if they feel they’ve helped make a meal, they’ll feel proud to taste what they’ve created. Obviously, what they can actually do to help is limited. However, they’ll be happy enough simply passing you things and chopping things with a toddler-safe knife. Your toddler will love growing their own veggies. They’ll find it fascinating watching their seeds turn into an actual food. Just like preparing a meal in the kitchen, this really helps them to feel a sense of accomplishment and they’ll be so excited to try the food they’ve helped to grow. A word of caution here however. It may seem like a cute idea to give the vegetables names. However, it could actually make your toddler not want to eat them once they’re ready. Giving them a name makes them feel like living things and sensitive children won’t want to eat anything they’ve grown attached to. You’ll find a wide range of toddler cutlery designs to choose from. Giving them plates, spoons and mugs with their favorite cartoon character on will really increase the fun appeal at mealtimes. They’ll be so excited to use their new cutlery and this simple trick can make a staggering difference to how much they eat too. Toddlers can find large portions of food daunting; particularly if they’ve never had them before. So, always cut up large pieces of food so it’s easier for your little one to grab hold of. It’s also a great idea to try out different preparation methods. Grating certain foods for example, adds a completely different look and texture to the plate. If you get a good variety of textures your toddler will enjoy trying each different one on their plate. Playing games at the table is another way to get your toddler to look forward to mealtimes. You can play games such as I-Spy in-between courses, or play a game together after the meal. If they know they get to play a fun game afterwards, they’ll be happy to finish off their food quickly to get to game time! Overall, it’s quite simple to make mealtimes more fun for your toddler. The above are just 10 great ideas you can try out today. Making mealtimes more fun does make it much more likely your little one will try new foods and eat what’s in front of them. Do you have your own tips our other readers may find useful? Share them below! You sure have a ‘sure’ list of tricks to see the food goes down. It is indeed a battle as you have rightly put it. They also choose what is not good for them. Distracting their attention from food sometimes helps. That is so right, iamawriter. Parents whose kids eat everything served on their plate are the luckiest ones. I am so sorry for giving my mom so much problems with food, I barely eat. But I think that those tips would have help a lot at the time. I will make sure tu use it when I have a baby. That’s funny elialva95. Be sure to tell her you’re sorry, haha. I hope you get a better appetite soon! You will need all the nutrition you can get once you start having babies. It’s for the baby’s own good, too. Damn, I wish my mother used this on me when I was a child. In our house it was more like ”sit down and eat that or you can’t leave the table”, haha. It got the job done but I don’t use that technique for my own boy. I love your ideas, they’re all so creative! Our little guy loves to make a mess with his food (don’t they all?) but I don’t mind at all. I want him to be a child and have fun even while eating. I feel like if you force them to eat a particular food that they won’t do it just out of stubbornness. I really want to try the ”let them grown their own vegetables” – it sounds like great fun not only for the kids but also for us, the parents. Are there any particular vegetables that you would suggest we try to grow or it doesn’t really matter? I agree, Jane. Food should be enjoyed, not forced down on one’s throat (although sometimes I’m guilty of doing that). Kids should learn to appreciate what they eat because they need nutritious foods as they grow up. As for vegetables, you can grow anything as long as your garden can accommodate them. It’s best if you could grow them organically or free from chemicals. You’ll be sure they’re safe to eat. You’re spot on when you say we should “make a story” with food! My husband read our little girl a folk story from our country that involves peaches, and she loved the story so much that she asked for peaches all the time, despite not even knowing what they were. The story captivated her, so naturally your advice is spot on! If we create a good story about the food, they’ll be entranced by it and get interested! I wish I had thought about giving the dishes fun names haha. Like you said, some food sounds plain unappealing for toddlers, and giving it cute names surely would have helped, that’s the best advice I’ve read on the topic! Thanks for another great set of advice! It’s really wonderful to hear your experience with tip #3, RoseLady. Now we know it really works wonders! It really comes in-handy when you have little kids. Great article, It’s hard to me to feed the my toddler because he doesn’t like food . ‘Eat your vegetables and we’ll had ice cream later.’ This work for my nephew when he don’t like to finish his vegetables. He’s not picky eater but there are times he preferred to play than to eat. This give me the idea what to do to get his attention to make him eat. Vegetables are the most tricky bunch of them all. My kids loves all types of fruits and would gobble or drink everything but with vegetables, I have to use every trick in the book to get them to eat these. These tips are quite timely.my little one has been messy up his meals lately. I try to change his meal to no avail. it the same and it gets me worried. good to have found this post.following it to the latter because I need a radical change. Great to hear you found the article helpful, augusta.